At the regular Board of Directors meeting of the Ridgefield School District on November 14th, the Ridgefield Public Schools Foundation (RPSF) announced a new grant program to honor the work of Paul Lewis, its co-founder and past president. Jeff Vigue, RPSF President, announced the Paul Lewis Innovation Grant. The new grant, sponsored by Columbia Credit Union (CCU), is designed to fuel innovation by funding programs that incorporate creative, original and out-of-the-box ideas for learning in Ridgefield public schools. The RPSF Board will award two $5,000 grants to a school or school program in the Ridgefield School District that will use the funding to provide opportunities aligned with the school district’s “Pursuing Premier Goals and Planning Blueprint” to benefit a large number of students sustainably in subsequent years. “We applaud the district’s vision that includes a planning blueprint and goals to create a premier school ecosystem, right here in Clark County,” said Columbia Credit Union’s President and CEO, Steve Kenny, in a press release from RPSF. Paul Lewis co-founded the Ridgefield Public Schools Foundation in 2009 and served as its president until earlier this year. His expertise in developing business partnerships, fund-raising, recruiting, and management provided the foundation with a strong start. Under Lewis’ leadership, RPSF raised approximately $188,000 in support of student learning in Ridgefield schools. To his credit, the foundation is now in its ninth year as a successful non-profit organization. At yesterday’s school board meeting, the district recognized Lewis for his valuable contributions to the Foundation to benefit Ridgefield students. Paul Lewis is recognized at the Ridgefield School District Board Meeting on November 14. 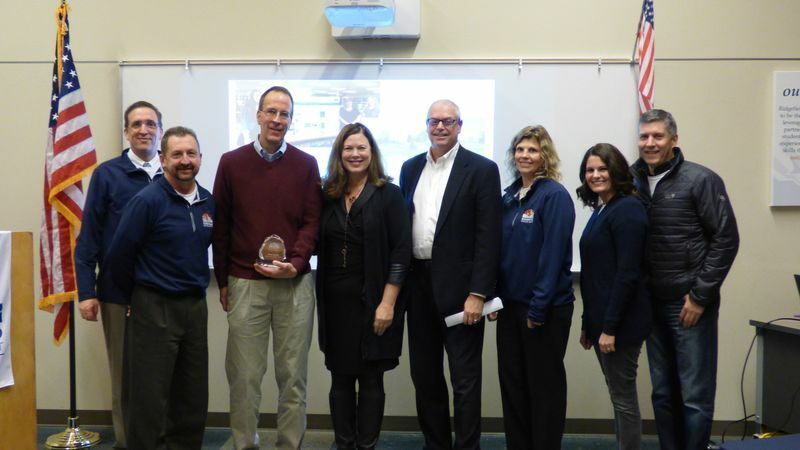 From left to right: School board members Joseph Vance and Scott Gullickson, Paul Lewis, Colleen Boccia (Columbia Credit Union's Chief Marketing Officer), Jeff Vigue (RPSF President) and school board members Becky Greenwald, Emily Enquist and Steve Radosevich. Applicants can look for the opportunity to apply in January 2018, and grants will be awarded in April 2018.